(AP) -- Northrop Grumman Corp. on Monday unveiled a new type of intelligence, surveillance and reconnaissance aircraft that can be flown either robotically or with a pilot aboard. The defense contractor said the Firebird aircraft would allow the military to simultaneously gather real-time high-definition video, view infrared imagery, use radar and eavesdrop on communications. 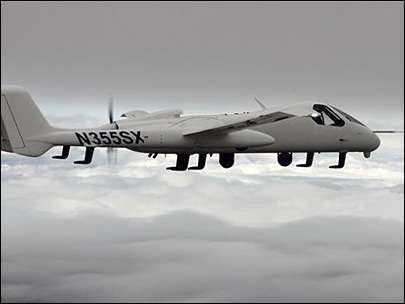 Shown in flight test photographs and video released by Northrop Grumman, the Firebird was designed and built by Mojave, Calif.-based Scaled Composites LLC, the builder of cutting-edge airplanes and spacecraft. The company promoted the aircraft with the certainty of cuts in U.S. defense spending in mind. "Firebird addresses future budgetary constraints by combining the best of our piloted and unmanned" systems, Paul Meyer, vice president and general manager of advanced programs and technology for Northrop Grumman Aerospace Systems, said in a statement. Rick Crooks, Firebird program manager, described it as an adaptable system that is highly affordable because of the number of different missions that can be accomplished in a single flight. The company did not say how much it cost to develop the aircraft. The twin-tailed aircraft has a slender wing spanning 65 feet (19.8 meters) and a pusher-propeller at the rear of its fuselage. Measuring 34 feet (10.3 meters) long and 9.7 feet (3 meters) high, the aircraft is listed as being capable of reaching a maximum altitude of 30,000 feet (9.1 kilometers) and a maximum endurance of 24 to 40 hours, depending on configuration. The Firebird will be demonstrated from May 23 to June 3, during a U.S. Joint Forces Command exercise dubbed Empire Challenge 2011. The exercise will be hosted at Fort Huachuca, Ariz., and include locations across the nation and in several other countries. Oh look they reinvented the OV-1 from the Vietnam era for about 20 times the price. Good going. Kinda like Apple reinvented the cell phone from the cold-war era, right?